Gaffers released in 1997 their first CD Rotor Slow Rotor Fast, an excellent lo-fi pop album. 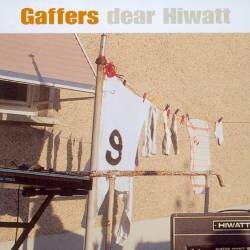 Five years later, it was time for a third output called Dear Hiwatt, very different from the first one. The music by the Gaffers still contains lo-fi pop elements and some distorted e-guitars, but they now venture more into a world of electronica. The opener Floppy Disk Anarcho is an atmospheric, relax song with strange samples. Nearly every song is filled with eighties computer sound samples which prevents the songs from becoming easy listening. All songs are played at a very minimalist level, vocals just get sparsely used and the repetitive sounds let you enter into a trance state. Even if the songs contain elements of a melody, the bizarre samples and the distorted noises give them a somehow futuristic and ambient touch. Difficult to say if the musicians have been more on valium or uppers. Maybe this is the first psycho electronica CD. The album isn't easy to understand, but a fascinating fact about Dear Hiwatt is that you always discover new sounds when you listen to this album. Friends of cover version will discover the Gaffers' version of Sad Lisa by Cat Stevens.